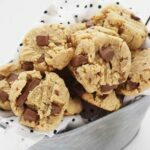 A delicious and easy cookie recipe that yields 12 delicious almond flour chocolate chip or chunk cookies. As many of you know, right now I am trying to reach a target weight by following the keto diet. I limit my daily net carbs to 50 and east foods that fit within my macros each day. I also intermittent fast to help the weight loss process. So far, 2 weeks in and I have lost 10 1/2 pounds and feel great! While I do not like to eat too many baked goods while doing keto I do have the occasional craving. I did keto last summer and was able to lose 17 lbs in one month, but I felt myself craving sweets so much! During this round of keto, I actually crave them less, but of course there is always that time of month where even my non-chocolate loving self needs a few nibbles to satisfy them feels. So, I decided to adapt an old almond flour recipe I used to make for my gluten free daughter. The only real swap I did today was subbing the honey for some Sukrin Gold sweetener. I was first introduced to Sukrin Gold from my friend Dawn who loves it. I decided to give a whirl because I was not too crazy about using more than a few packets of stevia in baked goods recipes. I find stevia to overpower sweets with an awful aftertaste. Sukrin Gold does not have any detectable aftertaste when baked into goods. It is a calorie-free sweetener that is the perfect brown sugar substitute. Sukrin Gold has 98% less calories versus brown sugar and a GI value of just one! That is why it is perfect for baked goods for diabetics. You can use Sukrin Gold in drinks, baked goods, and marinades. The possibilities are really endless to be honest! I normally use raw honey for these Gluten Free Chocolate Chip cookies, but Sukrin Gold was the perfect substitute and allowed my almond flour cookies to bake up perfectly. 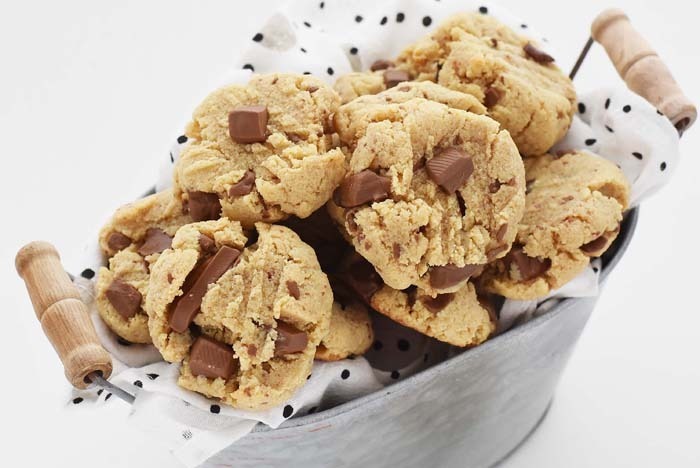 So this cookie recipe is pretty simple if you ask me, and the best part is it makes 12 cookies. I find recipes that make less cookies fit my lifestyle better because I can portion them out into a few days. 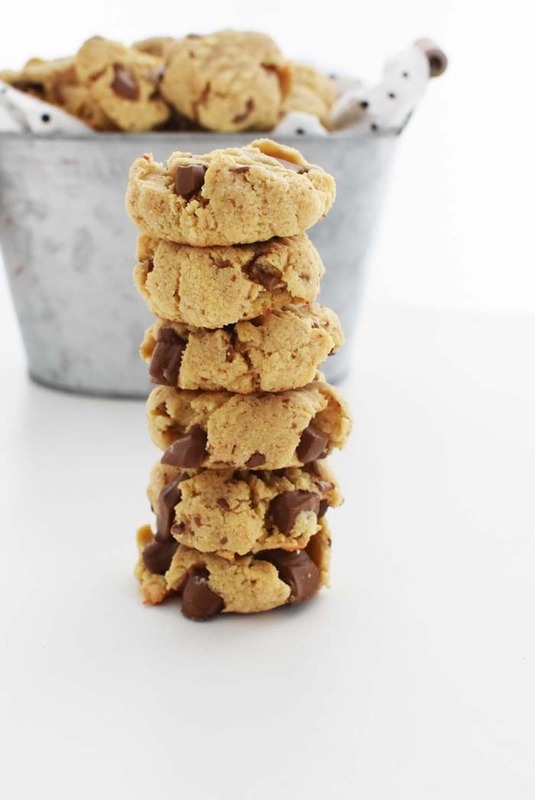 You will need almond flour, butter, baking powder, sugar-free chocolate chunks or chips. I used Simply Lite Low Carb Milk Chocolate. You can find it on Amazon or Trader Joes! This recipe also calls for one eggs and vanilla extract. I gave these a whirl without the extract and they still tasted great because my chocolate base made up for any flavor issues. If you are new to the keto world, let me tell you–Amazon is the BEST place for ingredients like Almond flour. I really love this Oh Nuts brand and found they had some of the best priced blanched almond flour. Another important tip is you want to use blanched almond flour and NOT almond meal–there is a huge difference. Clean hands are your best tool in the kitchen for fully combining this thick, dough. Please note that this dough is not really sticky and more of a play dough time consistency. 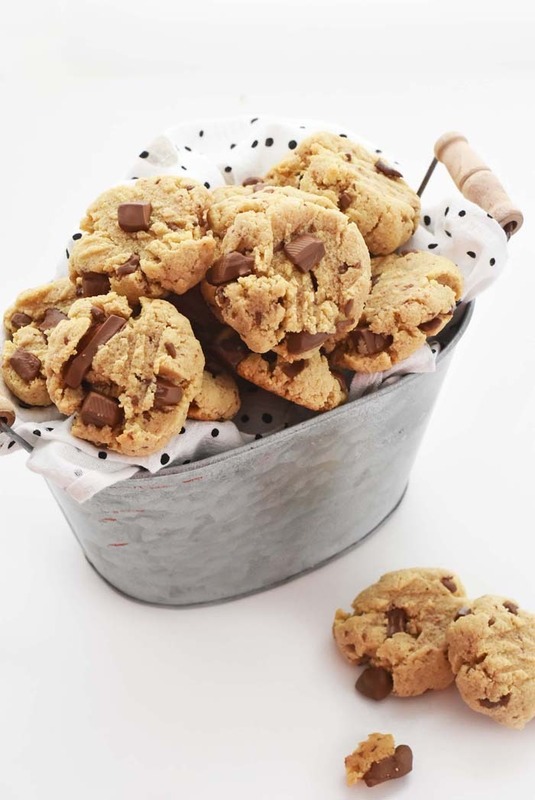 You will want to use a large parchment-lined baking sheet for these cookies, and a fork to gently press them down since almond flour does not spread like normal white flour. Simply Lite Milk Chocolate Bars -half of a chopped bar is plenty for this recipe. Please note, these cookies are a treat and may kick you out of ketosis. In a large bowl add flour, baking powder, and sea salt- whisk. In another smaller bowl, cream the Sukrin Gold, butter, egg, and extract. Scrape wet batter into dry batter. Using clean hands work the dough until combined. Mix, and form tablespoon-sized balls. Add balls to your baking sheet. 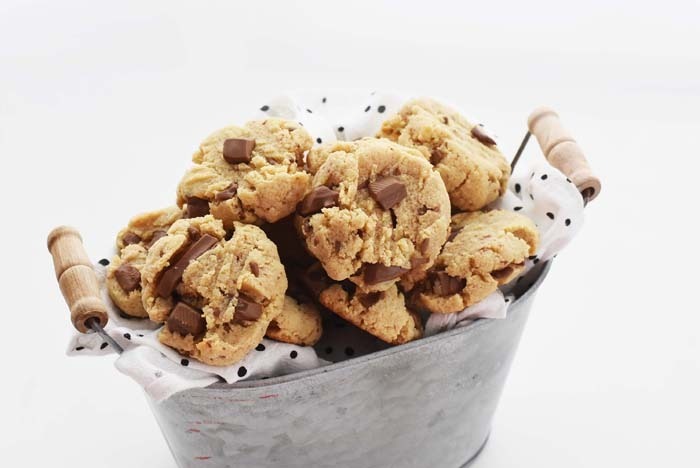 Using a fork, gently press down on each cookie. These look absolutely delicious I can not wait to try this myself. I have been trying to find great healthy recipes for a while now. I even tried a banana batter it wasn’t my favorite. I can’t wait to make these! The idea of having cookies while still maintaining my healthy lifestyle is so awesome. Thanks for the recipe! Goodness, these cookies look amazing! I use a lot of honey in my baked goods, so I will have to try Sukrin Gold as a substitute soon. These cookies look like they would be amazing. I love that they are keto friendly! The substitution sounds great. I think this sound great. I haven’t tried a keto diet. I love Keto friendly pastries especially cookies. I hope I can try making this. I’ll share this to my friends.